(INDIANAPOLIS, IN) - A pair of timely home runs and a dominant day on the mound led the Charlotte Knights to a 3-0 win over the Indianapolis Indians in the finale of their four-game series from Victory Field on Sunday afternoon. For the third straight game, the Knights were able to score in their first turn at the plate. This time, it was Matt Skole crushing a solo home run to right with two outs, his third of the year, to give the Knights the early 1-0 lead. 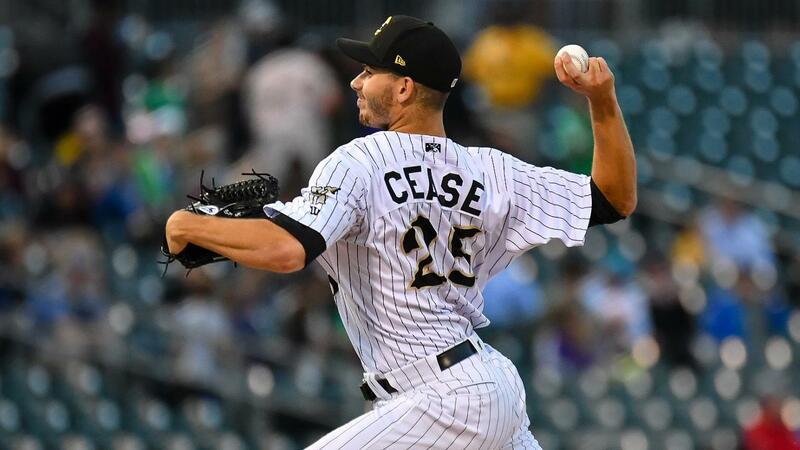 That would prove to be enough support for RHP Dylan Cease (2-0) in his second Triple-A start. In the first, Cease quickly retired the Indians in order. After issuing his first walk of the season, Cease rebounded to get an inning-ending strikeout in the second. A two-out single in the third didn't phase Cease, who induced a fly out to strand the runner. Indianapolis again threatened in the fourth with a leadoff single, but a ground ball double play got Cease through the inning unscathed. An inning later, Cease set down the Indians in order with rain falling, bringing an end to his start. Over 5.0 innings, Cease gave up just two hits and one walk with five strikeouts to earn his second straight win. He has not given up a run over 10.0 innings for the Knights this season. Caleb Frare kept the Knights in front with a clean sixth inning. Carson Fulmer worked into trouble in the seventh as the Indians had the tying run on third with nobody out. But a ground out and back-to-back strikeouts kept Charlotte in front. Ryan Goins put the game out of reach in the eighth with his first home run as a Knight, a towering two-run drive down the right field line, to increase the lead to 3-0. From there, Fulmer quieted the Indians again in the eighth and Evan Marshall retired the side in order in the ninth to earn his first save as a Knight. The win is Charlotte's first on the road this season and snaps the Indians' six-game winning streak. It is also the Knights' third shutout. The Knights will continue their 11-game road trip tomorrow as they start a four-game series with the Gwinnett Stripers (Triple-A affiliate of the Atlanta Braves) on Monday night. Pre-game radio coverage of the 7:05 p.m. game is set for 6:50 p.m. on 730 The Game ESPN Charlotte. The "Voice of the Charlotte Knights" Matt Swierad will have the call for all of the action. RHP Donny Roach is scheduled to start for Charlotte.